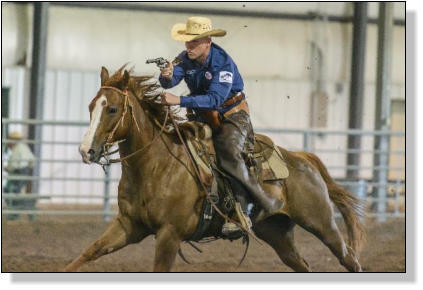 Tearing a page from the book of great American cowboys, mounted shooting is as close to the Old West as you can get short of a time machine. 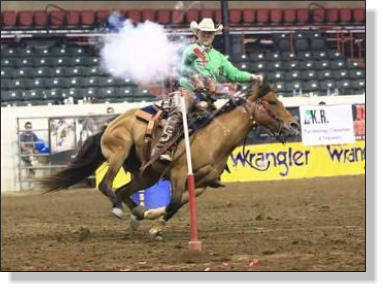 This adrenaline-pumping arena sport has cowboys and cowgirls nationwide slapping on six guns and tuning up for the rides of their life. This is the place to start! No experience needed! This class will include gun safety and operations. 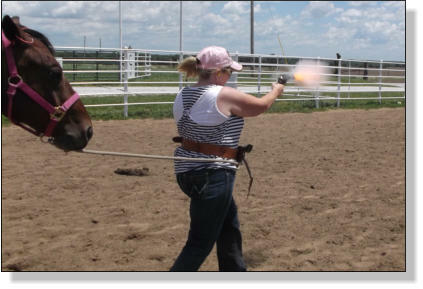 We will work together desensitizing your horse to gunfire and balloons. All necessary equipment will be provide for you. I can provide one on one introduction to Cowboy Mounted Shooting or hold a clinic for up to ten people. Training is available at the ranch for you and your horse. Here your horse can learn to accept gunfire and be introduced to the sport in an easy, non-threatening manner.